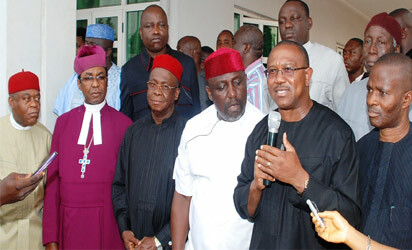 From left: Gov Theodore Orji of Abia State; Anglican Bishop of Enugu, Bishop Emmanuel Chukwuma; Govs Martin Elechi (Ebonyi); Rochas Okorocha (Imo); Peter Obi (Anambra) and Acting Governor Onyebuchi of Enugu State during the South-East stakeholders meeting in Enugu, yesterday. Photo: Hill Ezeugwu. Facts have emerged why the PDP governors and leaders in the Southeast are kicking against the choice of former governor of Anambra State governor, Mr Peter Obi as the party’s vice presidential candidate. The Atiku action has torn the South East chapter of the party apart. According to an impeccable party source who pleaded anonymity, the governors and some of the leaders of the party in the zone have accused Atiku of reneging on his earlier promise and vowed to work against his candidacy. The PDP chieftain told Sunday Sun that Atiku had earlier promised to use the former Governor of the Central Bank of Nigeria (CBN), Prof. Charles Soludo as his running mate. The chieftain who is also a Senatorial candidate in Anambra State said that the Southeast governors and some PDP leaders from the zone were working on endorsing President Muhammadu Buhari, since according to him, Atiku has shown that they do not matter in his political calculations. “There will be peace if Soludo is made the running mate because that was what we agreed,” he said. Asked if they still would have protested if former Minister of Finance and Coordinating Minister of the Economy, Dr Ngozi Okonjo-Iweala, was chosen by Atiku he said: “There is no problem with her, but Soludo is better. You know the woman is difficult, when you go to her for anything she will accuse you of wanting to be given the resources of the country. Governor Umahi had last Friday issued a statement dissociates himself from a release by his Chief Press Secretary, where the choice of Obi was hailed. He said that the governors and leaders of the zone were not consulted before Atiku settled for Obi. He explained that yesterday’s meeting by the governors and leaders of the party was to agree that Obi and his people would not have their way. He disclosed that he had met with Atiku and his wife and told them that Obi’s choice cannot sell in Igbo land. Narrating how they came about Soludo, the PDP henchman claimed that he and some leaders of the party held a meeting three months ago where Atiku promised him to pick his vice presidential candidate from the Southeast. “He told us that the person he had in mind was Soludo and Anambra governor also supported it. “I was instrumental to him winning the nomination. We started this spin doctor job months ago. Atiku met with me several times alongside Gbenga Daniel. He came to my house many times. “After he was nominated, he went back on his promise, he changed completely and now brought Peter Obi instead of Soludo that we agreed upon. This is why all the Southeast governors and PDP leaders are kicking. Everybody is mad at Atiku for that singular decision. “I heard Atiku said he did not consult us because PDP governors from Southeast voted for Tambuwal, that they did not vote for him. “He said that Wike agreed that Peter Obi should be his running mate. But in doing that, he jettisoned the promised he made to us that we will choose the person that will take the slot. Apart from other reasons they adduced for opposing the choice of former Anambra governor, he contended that “Peter Obi is not a liberal politician, he is a conservative. His candidacy will not sell. Many of us who know him very well know that he is unreliable, tricky and selfish. He says one thing and does another. There is a problem in the PDP house and if it is not handled well it will jeopardize Atiku’s ambition.